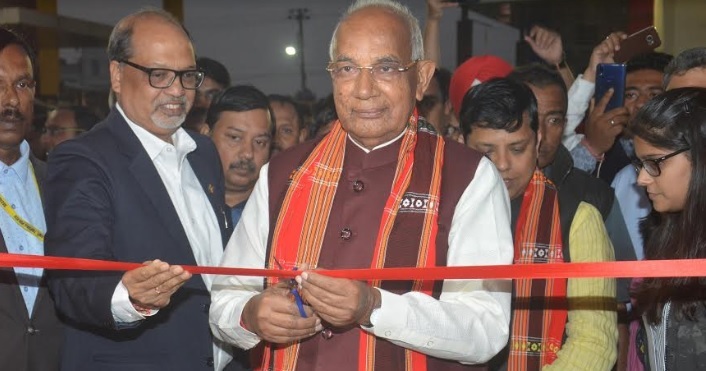 The Governor of Tripura Professor Kaptan Singh Solanki inaugurated the 29th Tripura Industries & Commerce Fair at the Agartala International Fair and Exhibition ground at Hapania on Tuesday. He was accompanied by MLA Ramprashad Paul, assistant high commissioner of Bangladesh, Agartala Kiriti Chakma, chairman of Tripura Industrial Development Corporation, Tinku Roy and director of Industries and Commerce Dr Sandeep R Rathod beside other dignitaries. After the inauguration, Padma Shri Rosam player of the state, Thanga Darlong was felicitated by the Governor. Addressing the gathering chairman TIDC Tinku Roy said that the state has all facilities for setting up industries right from surplus electricity, gas, and land. Moreover, the connectivity has also improved. Quoting the Assistant HC of Bangladesh, the TIDC chairman viewed that Tripura should further improve its business relationship with Bangladesh. He also viewed that according to the latest statistics, Tripura annually imports items of an amount of Rs 400 crores and exports upto Rs ten crores items to Bangladesh and which should not have happened as the state has huge scope for export but it did not happen. On the inaugural day, a large number of people came to the fair premises which are an opportunity for them to get better quality items at reasonable prices under the same roof with a variety of choices. Various small and large investors in the state of Tripura has displayed their activities in their pavilions and ONGC is one of them. Governor of Tripura, Professor Kaptan Singh Solanki along with other dignitaries visited various stalls. The Governor viewed that Tripura’s natural resources provide enormous scope for setting up of industries build on agro and allied products beside bamboo, handicraft, handloom, natural gas, rubber, tea, and tourism. He emphasized on improving business relation including the tourism sector between Tripura and Bangladesh and which shall be win-win and beneficial for both. Meantime, Asset Manager of ONGC Tripura Asset G K Singha Roy said that in the fair ONGC has tried to display a model of its activities in the state for its development which is not limited to just its gas exploration and trade activities but also the CSR activities for the welfare of the people of Tripura. This fair has also improved the business relationship between India-Bangladesh as trade and industrial fair not only helps artisans in selling as well as displaying their products but it is a sign that India’s northeast which till a few years back was considered to be economically backward is going for a resurgent. Moreover, the fair also resembles that Northeast is investor friendly, and it is scope for creating awareness on utilizing of local resources by local entrepreneurs and confidence-building measure among the entrepreneurs, investors, and financers. The eighteen days fair shall conclude on February 15 next.